InCorps is very proud to present our newest Expert! Do you have questions about music, technique, style or else? InCorps is bringing the best of the best experts from DCI/WGI to you! After Jim Casella, Wayne Downey, Jonathan Schwartz and Paul Rennick, InCorps is proud to present the mysterious Banished Beyond as our newest Expert! Do you have a question for Banished Beyond? Visit his special Ask an Expert Page and win a DCE or IPE DVD. Who is the mysterious Banished Beyond? 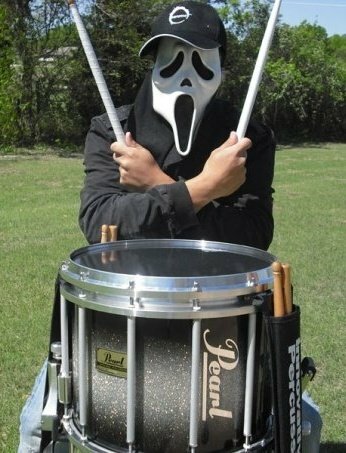 Banished Beyond is an avid percussionist longing to find a place in the Drum Corps Community. Legend has it, that he was spawned in the depths of Mount Doomforge, from dragon’s blood and shattered orc bones. An evil wizard of black magic cast a banishment spell on him, fusing a mask to his face, never to be removed. Banished Beyond relocated to the Banished Cave and spent many years practicing numerous percussion techniques and styles. After many years of preparation, Banished Beyond began the long journey to find his way to the 50. Many tapes have recently surfaced, depicting Banished Beyond’s attempts at making the cut, only to literally be "banished beyond existence". It is uncertain where these tapes come from, or who filmed them, but we can only thank the advancements of technology today for providing us with such footage. InCorps tip: Watch as many videos as you can before you send in your question(s). Have fun! Posted by News Editor on Sunday, January 3rd, 2010. Filed under Other.